Approximately 7.3 million Am​​​​ericans follow a vegetarian diet with about 1 million calling themselves, vegans. If that describes you, it only makes sense that you’d want to extend your lifestyle to the choices of health and beauty products that you use. But picking the right ones is a daunting task. The $56 billion US cosmetic industry continues to grow despite the influx of imports. With literally thousands of products available, how do you narrow it down? Due to this fact, it’s essential to understand what you’re buying. That means knowing about the ingredients in your makeup and whether they truly are vegan. PS: Below these reviews we explain LITERALLY EVERYTHING you wanted to know (and more) about vegan and cruelty free makeup brands and why so many people are making the switch. What Is Vegan Beauty And What Makes A Product Vegan? What Ingredients Are Not Vegan In Makeup? What Is the Leaping Bunny Logo? Why Choose Vegan Makeup Products? The use of pigments for adornment goes back even before modern humans evolved some 200,000 years ago. Our ancestors used materials around them like iron oxides and ochre. Probably, using vegan cosmetics is getting in touch with your ancient roots. The essence of being a vegan means that you’ve chosen to avoid products that are animal-based or use their by-products. With over 57,000 ingredients in cosmetics, that’s a tall order. Part of the difficulty in finding makeup for vegans is that many products include dozens of additives that a layperson would have trouble interpreting. Having a name that you can’t pronounce isn’t the problem. Instead, It’s understanding what a particular one is and what is its source. While the definition of a vegan product is straightforward, knowing how to choose the right one for you is another story. Another concern is product safety. Reading the label isn’t enough to distinguish animal-free testing makeup. You may see some products labeled as cruelty-free. That means it wasn’t tested on animals -- something else you may want to consider when choosing between vegan makeup brands. It’s easy to identify makeup that isn’t vegan if it contains ingredients we recognize like lard. However, the waters get muddied when it comes to animal by-products. Most people are probably unaware of the dizzying number that are used in food, household products, and, yes, even cosmetics. For example, beef fat and fatty acids are common ingredients in soaps, shaving creams, and perfumes. Other by-products include tallow, lanolin, gelatin, and guanine. Furthermore, you have to remember that much of the makeup sold in the United States is mass-produced. These ingredients are inexpensive using automated processing, to put it bluntly. There are a couple of caveats that you need to know. These manufacturers deal with millions of products. As a result, sourcing for ingredients may vary from time-to-time and even by location. This is the reason that their websites will ask for batch or serial numbers of their products if you have a question about it. Some ingredients have both animal and plant sources which can make it even harder to know what you’re getting. A few product labels will provide this information for you, especially if it’s a potential allergen like dairy or fish. Consequently, if you're in doubt, go the company’s website and look for product information. It also helps to know what the law says about this issue too. The US Food and Drug Administration (FDA) regulates cosmetic companies. But they deal with these products differently than a drug. That means manufacturers can sell them without premarket approval by the agency. It’s the same thing with dietary supplements. Remember, the FDA’s job involves safety. A cosmetic company must label its products with its correct usage and the appropriate warnings. That’s why you’ll see wording like put lip balm on your lips. In addition, they must also list the ingredients using accepted language in the industry. This explains some of the long words you’ll see. Labels will show additives and flavorings too. A manufacturer may not have to list everything if it includes a proprietary ingredient or what the FDA calls a trade secret (anything that a competitor could use to gain a market advantage). Most noteworthy, they’ll go after a company that has misleading labeling or if a product is hazardous, after the fact. As a result, you see foods labeling for gluten-free. The potential for harm exists. But that’s not the case with animal by-products and makeup for vegans. It’s up to you as the consumer to be informed. You have to remember that the FDA gets its authority to regulate cosmetics and other products through legislation. Hence, that places some restrictions on what they can and cannot legally do as frustrating as it seems at times. But labeling regulation applies both to products produced in this country and those imported from abroad. You can expect to find a host of healthy ingredients in vegan makeup brands. These may include oils such as omega-3, 6, and 9 fatty acids. Essential oils such as sandalwood, ylang-ylang, and vanilla are also popular. Vitamins C and E could also be included which can improve the appearance of your complexion. A lot of products will use natural sources for colors such as coffee, spices, and other ingredients. Often, you'll see the word extract or something similar. Many organic and vegan brands will also “translate” a chemical’s name to something you can understand or identify when something is plant-based. Some companies will go the extra mile to label products gluten-free, paraben-free, or something similar. A hallmark of a lot of them is transparency in labeling to help you make good choices. However, the line between vegan and natural is often blurred, especially since the FDA doesn’t regulate how the latter is used by marketers. One thing to bear in mind is that organic and vegan are not synonymous. If you prefer these kinds of products, look for the certified label on the packaging which means that they meet the standards for this designation. The FDA doesn’t regulate this part. Rather, it is the job of the USDA Agricultural Marketing Service’s task. You may find some products with the Leaping Bunny logo on them. As a result, that gives you the assurance that these are products that are cruelty-free. It is the mission of Cruelty Free International to respect and protect animals without the need for testing on them. The organization began in 1898. Today, manufacturers can apply for membership and certification in The Leaping Bunny Program. Especially relevant, when you see this logo on cosmetics, it means that the company did not test their products on animals. Choosing vegan makeup brands is a logical segue. It’s not unlike claiming to be a vegetarian because of your concerns for animals yet wearing leather shoes. And if you want to make it a lifestyle, it’s an excellent way to walk the talk. But the chances are that you’ve decided to become a vegan because you take the issue of animal cruelty very seriously. There’s no way to sugarcoat the fact that testing is not pretty. If you need some convincing, check out the following video. However, be prepared, It’s tough viewing. The fact remains that there are other ways to test cosmetics without involving animals. Yes, the concerns for safety are valid. Correspondingly, that’s why the Federal Food, Drug, and Cosmetic Act of 1938 was passed, albeit, a reaction to a tragedy that caused over 100 deaths. Safeguards are essential to ensure that something like that doesn’t happen again. However, alternatives exist such as in vitro screens, artificial human skin, and a vast knowledge base from previous testing. The fact remains that the industry is largely self-regulating in the United States. That may soon change if the Personal Care Products Safety Act passes which would require the FDA to encourage companies to minimize the use of animal testing. In the meantime, it’s important to be aware of the full nature of the products that you buy and to know what makeup companies test on animals. Then, you can make informed choices. Part of the problem rests with manufacturers who produce their products overseas in some countries that require pre-market animal testing. Be careful of the language that some companies use to avoid disclosing this information. They may say that they don’t do animal testing, yet a third-party lab does instead. Or look for statements saying they don’t test in the United States. It’s all about the wording. Are you confused yet? We understand how difficult it can be to make choices that can you live with when it comes to choosing animal-friendly makeup products. That’s why we tested the best vegan free makeup products ourselves to come up with our recommended list. The ingredients of the Benecos Eyebrow-Designer, All-N​​​​atural Eyebrow Pencil and Brush consist of a blend of jojoba oil, cottonseed oil, and vitamin E to add that pop of color to fill in sparse brows to complement your eye makeup. It is gluten-free and hypoallergenic. We loved the fact that it is certified cruelty-free too. It goes on smooth to make application easy with color that lasts all day. And a little bit goes a long way. That makes it stand out as a good value. 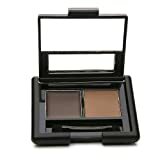 Canvas Matte Cream Mineral-Based Eyeshadow line includes your choice of 25 colors that are all cruelty-free, gluten-free, and even paraben-free. They have a luxurious feel to them when you apply them. We loved the fact that it lasts the entire day. The eyeshadows feature a bit of sparkle that left us feeling pampered. The packaging includes a mirror for easy application on the go. 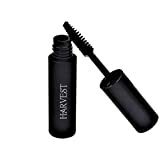 Harvest Natural Beauty Lengthening Organic Mascara is an excellent choice if you’re looking for a product that is organic as well as cruelty-free. It is smudge proof and water resistant for color that will last. The vitamin E is a nice addition to moisturize your eyelashes. 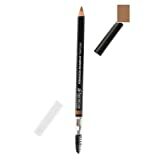 It contains natural ingredients like coffee powder and cinnamon bark extract in its brown and black shades. We liked how the brush made applying it easy and how it separated our lashes and added some volume to them. 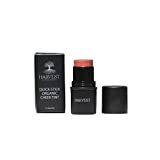 Harvest Natural Beauty Quick-Stick Organic Cheek Tint stands out as a Leaping Bunny certified product. It is also certified organic. 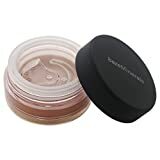 We liked the feel of the cream blusher that moisturized our skin with its addition of castor seed oil and carnauba wax. This product comes in four pretty shades that you can use on your cheeks, lips, or eyes for a splash of color. If you’ve only used powder blush, we think you’re in for a treat. The color goes on flawlessly and lasts all day long. EMANI Vegan Cosmetics Flawless Matte Foundation comes in four shades to match any skin tone. Like other products we reviewed, it is also gluten-free and cruelty-free. It goes on very light and doesn’t feel heavy. You can use it on any skin type even if it’s sensitive. We liked the finish which was soft and matte without any shine. It felt good going on our face. The coverage is good with the staying power to last all day. If you’re tempted to throw out all of your makeup, don’t do it. That would be wasteful. Instead, make the move toward vegan makeup brands gradually. Replace your current products with vegan beauty products as you use up what you have on hand. It’s all about baby steps. It doesn’t have to be expensive either. Even swapping out one thing is a step in the right direction. You can have the satisfaction of knowing that you’re embracing not just a diet but a vegan lifestyle..